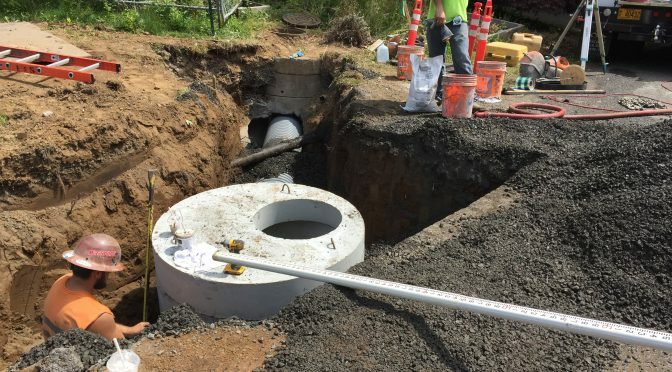 Crews have installed 500 feet of new water main and almost 5,500 feet of upgraded stormwater pipes to help manage stormwater in the project area. 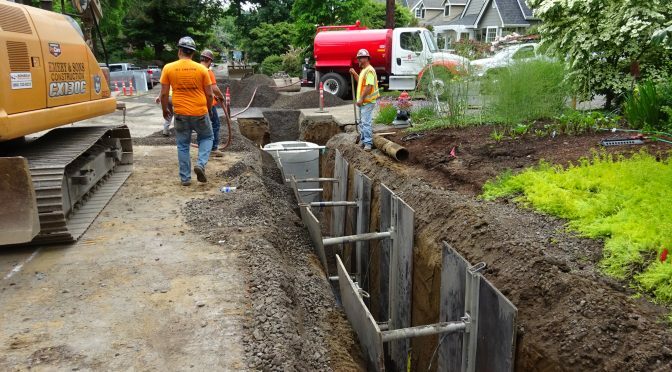 Along with the new rain gardens that will be installed this fall, these improvements will address several areas that have historically experienced flooding or drainage issues, and will benefit the water quality of Tryon Creek. Pictured above: crews use a “sheep’s foot” to help compact the gravel/fill in the trench where the new storm line was installed on D Avenue. NW Natural is now complete with their gas relocation work! Today, they are cleaning up and demobilizing equipment in the area. City crews have also repaired the water line at the corner of 8th and D.
Thank you to everyone in the neighborhood for your patience during this phase of the project. The changing road closures have been frustrating for everyone and we certainly appreciate your understanding! Next week, Emery plans to have a small crew working on consolidating rock piles, conducting televised inspections of storm lines and doing miscellaneous clean-up work in preparation for the major street work. In observance of Independence Day, no work will take place on July 4. With crews wrapping up the utility work in the project area, the next stage of major road reconstruction on D Avenue is about to begin! The entire roadway will be dug-out, re-rocked, regraded, and repaved. A new sidewalk will be built, parking areas will be more obvious, and about 40 landscaped rain garden facilities will be installed to help manage street runoff. To enable this work, starting the week of July 9, full (24/7) road closures will be in place in multiple block segments along D Avenue. The first segment to close will be from 1st Street to 4th Street. The second segment will be from 4th to 7th, the third from 7th to 10th and final segment from State to 1st. By mid-July, the entire ten blocks of D Avenue will be closed to all traffic 24/7 for up to eight weeks. At most times during this closure, the contractor will maintain north/south access through the intersections of D Avenue at 1st, 4th, 7th and 10th Streets (see map below). There will be short-term closures at these intersections while crews excavate the road. 1st Street, between D and E Avenues, will also be closed temporarily (up to three days) during the first base lift of paving. Access for residents living in the closed areas on D Avenue will be maintained at most times, but there will be periods where driveways are blocked. Access to D Avenue from alleys will be closed—alleys will be barricaded at D Avenue. Neighbors will need to access alleys from E or C Avenue. On street-parking will be prohibited along D Avenue – neighbors will need to park on a side street. Unfortunately, the project team recently received reports that some D Avenue residents have received nasty notes left on their cars from nearby neighbors while they have been parking on side streets. Parking on a public street and in the public right-of-way is allowed. With major road construction taking place for the project, residents located within the D Avenue project area – particularly those without alley access – often do not have a choice but to park on side streets when their roads are closed and parking is prohibited in the work zone. These residents are impacted by construction taking place in front of their homes, which will continue through the fall. Please have some patience and understanding for your neighbors as construction takes place in the neighborhood. Allowed work hours are 7 a.m. – 6 p.m. Monday to Friday. With all the work taking place in the neighborhood, please be alert, drive safely, choose another route and plan ahead for travel delays. Construction schedules change frequently. We will strive to keep residents informed through these regular updates. For more information about what to expect during construction, review the latest newsletter or contact the project team. Most of the major utility work on potions of 1st, 7th, 8th and 9th Streets is complete. 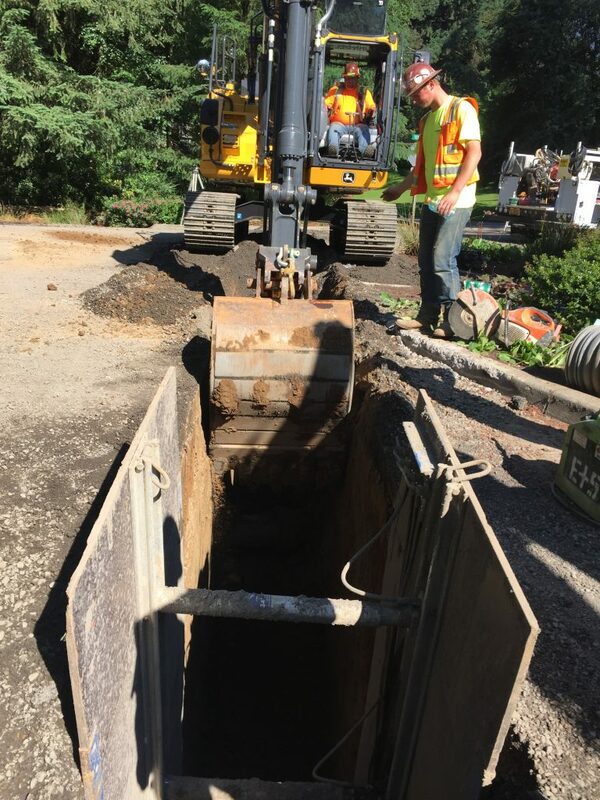 Over the next two weeks, crews will be making some minor adjustments to manholes, catch basin inlets and conducting other miscellaneous activities. Final restoration of these side streets is expected to occur in mid-July. 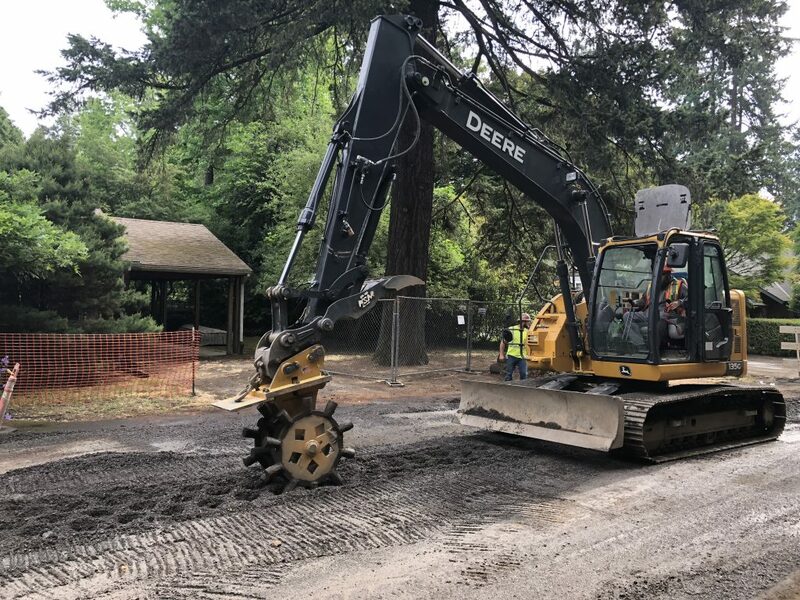 During the week of Fourth of July, Emery plans to have a small crew working on consolidating rock piles, conducting televised inspections of storm lines and doing miscellaneous clean-up work in preparation for the major street work. In observance of Independence Day, no work will take place on July 4. NW Natural Gas has finished relocating their gas main, and is progressing with the service connections. We expect this work to be complete by the end of next week. For questions regarding this work, please contact Rich Girard on 503-226-4211 or r2g@nwnatural.com. Now that the new storm line has been installed between 7th and 10th Street on D Avenue and is in service, City crews can start repairing the water line in the intersection of 8th Street and D Avenue. Crews expect to start on Monday, June 25 and take about a week to complete the repair. During this time, there will be some minor water service interruptions (temporary shut-offs for short durations). Impacted neighbors will be notified in advance via a door hanger. Temporary road closures will be in place during this work. Check out the road closures page for daily road closures. Emery’s goal is to start the major street excavation work along D Avenue in mid-July. This will result in full 24/7 road closures on D Avenue for up to two months. We will provide more information once the date is known. Crews will likely begin implementing the rolling closures at 1st Street, working west towards 10th. 1st Street between D and E Avenues will also be closed temporarily during the first base lift of paving. Once all the major street work is done and D Avenue is ready to be paved, 1st Street will receive the final top lift of asphalt. For more information about the overall work plan, visit our project schedule page. Unfortunately, with the nature of the work occurring and the number of crews operating during this phase of the project, road closures in the project area change on a daily basis. We understand this is frustrating for everyone in the neighborhood and we appreciate your patience. For those interested in finding out more about what roads are closed each work day, we’ve set up a new “road closures” page that you can access through the project website. We will aim to update the information on this page once we get confirmation from the crews working that day. The City is also in the process of setting up an agency/organization account with Nextdoor, an online neighborhood forum, where we can then provide targeted information to the First Addition neighborhood regarding the daily closures. Once this is set-up, we will post the daily closures there as well. The City is acquiring a piece of equipment that will allow our Public Works crews to improve the surface of the alleys by grading out potholes and redressing the alleys on an annual basis. 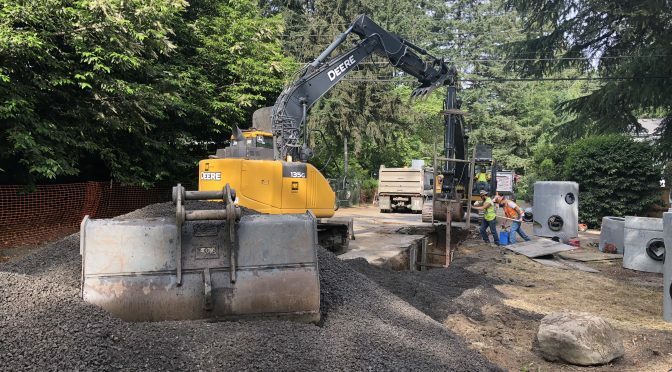 The City will be regrading all the alleys surrounding the D Avenue project area as soon as the major project related work is complete and D Avenue is repaved. The alley work is tentatively scheduled to take place later this fall. To ensure garbage collection is maintained for all residents in the neighborhood while the project is underway, Republic Services is temporarily starting their collection rounds an hour earlier (5 a.m.). Emery is also starting work an hour later on Fridays, to minimize any conflicts with project crews and collection services. With all the work taking place in the neighborhood, please be alert, drive safely, choose another route or plan ahead for travel delays. On Monday, June 18, and Tuesday, June 19, crews expect to be working in and across the intersection of 10th Street and D Avenue to install a new storm line. During this time, 10th Street will be closed to through traffic between C Avenue and Bayberry Road. D Avenue will also be closed at 9th Street. Please follow traffic signage and plan ahead for travel delays. Access will be maintained for residents located within the closed area. Construction continues on the project in the First Addition Neighborhood. Emery is currently working on installing storm lines on 7th Street and D Avenue, and water line service connections on 1st Street. Soon, crews will start working on the storm lines on 8th and 9th Streets between D and E Avenues. NW Natural is also working in multiple block segments on D Avenue to relocate their gas main. Safety is by far our first priority. Thank you to neighbors, pedestrians, bicyclists and vehicular traffic for avoiding the active work zones and closed areas during work hours. Construction sites are busy places with lots of moving equipment, open trenches and deliveries of materials. Please continue to use another side street or alley to get to your destination, and abide by the traffic control signage. This is to maintain the safety of all. NW Natural Gas continues to relocate their gas main on D Avenue. This relocation has been slow. As a result, Emery continues to shift their work plan, as most of NW Natural’s relocation work needs to be completed before the major road reconstruction work can take place along D Avenue. We continue to coordinate with NW Natural. 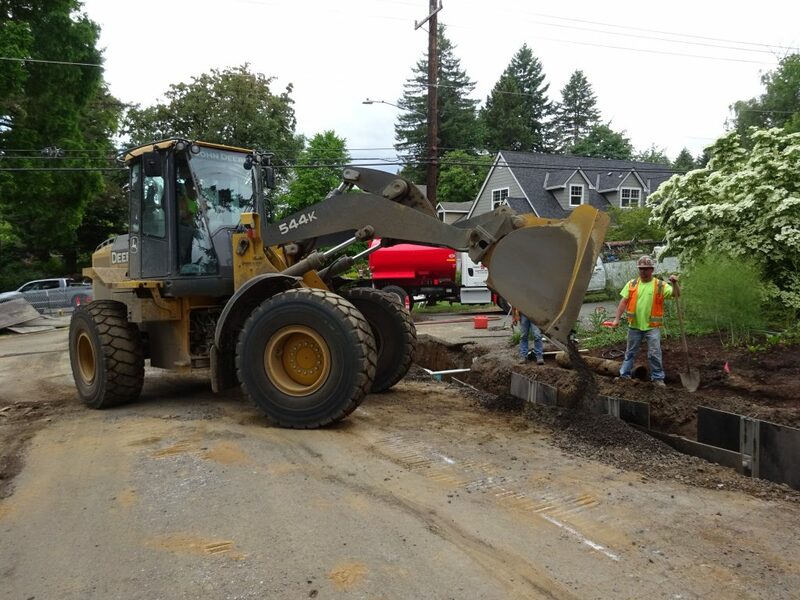 For concerns or questions regarding this work, including potential temporary gas service shut-offs, please contact Rich Girard on 503-226-4211 or r2g@nwnatural.com. This work is expected to be complete by tomorrow. Crew 1 will then move to 8th Street at D Avenue and progress north towards E Avenue installing a new storm line. 8th Street between D and E Avenues is expected to be closed during work hours for up to two weeks. Crew 2 continues to install the new storm line on D Avenue, currently working between 7th Street and 9th Street with temporary rolling road closures in place. They expect to be at 10th Street by the end of the week. From here, Crew 2 plans to move to 9th Street between D and E Avenues to install a new storm line. Work is almost complete on the water line for 1st Street between E and D Avenues. This week, Crew 3 will be working on testing and chlorinating the new line, and installing water services. During this time, there will be some minor water service interruptions (temporary shut-offs for short durations). Impacted neighbors will be notified in advance via a door hanger. This work should be wrapped up by June 15. 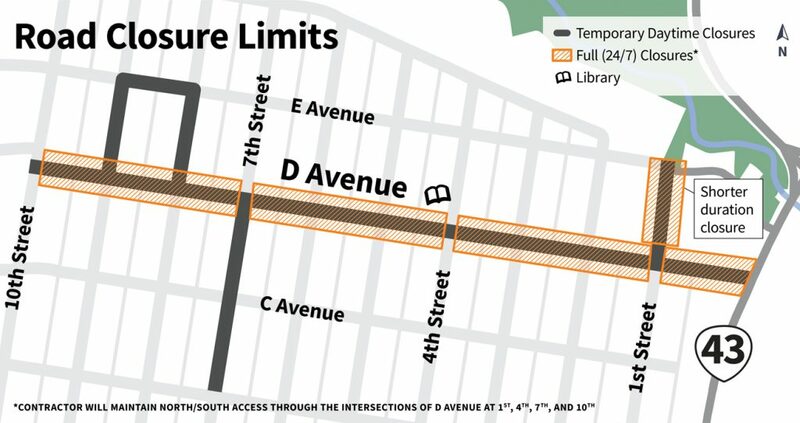 Given NW Natural’s progress with the gas line relocation, the full 24/7 road closures for D Avenue (and part of 1st Street during paving) won’t likely be in place until late July. We will provide more information once the date is known. This closure is expected to be in place for up to two months. LOCAL ACCESS ONLY – What Does That Mean? 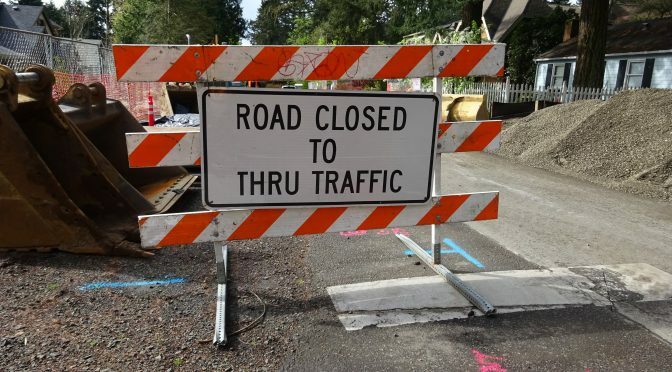 If you are a resident in the neighborhood, or have driven through the area recently, you’ve probably come across one of the road closure signs that says “road closed to thru traffic local access only”. You are only considered “local” if you live on the street within the closed area and need to get into the immediate area, not through it. This includes residents who live on the closed street, emergency vehicles, visitors, babysitters, landscape workers, garbage and recycling vehicles or deliveries. Everyone else is considered “thru traffic” (including other neighborhood residents and traffic) and must take another route to get to their destination. So that everyone stays safe, please obey the signage and allow extra time to get around the neighborhood. If people continue to cut-through the work zones, police will be conducting extra patrols.